Great color on that pillow. Would look perfect with a solid white one to accent it. That pillow would certainly pop some much needed color into my living room. I have always loved geometric designs! I love this pillow. The colour ad the design are so pretty. This would look great in my daughter's room. She is a purple freak, no doubt. I love this design but have decided I'm not in the time of life for fancy pillows. My boys are always just throwing them on the ground. That lattice look is timeless. 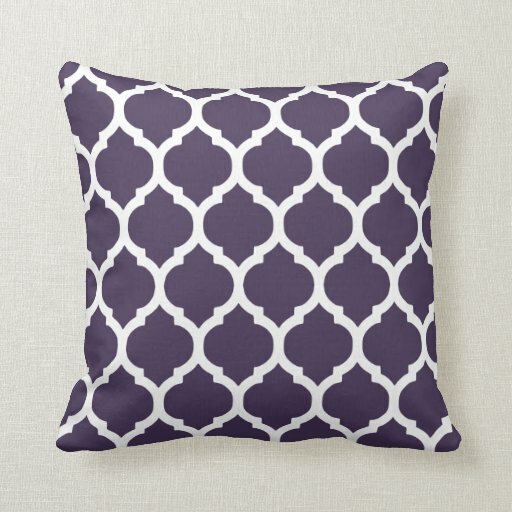 I like the colors too, this is a nice throw pillow. I love this pillow. I'm thinking about re-doing my bedroom in some soothing blues. That Moroccan motif is so hot these days! I have my eye on some cool stuff in Winners right now. This is a cool pattern. I LOVE anything purple! These are gorgeous!